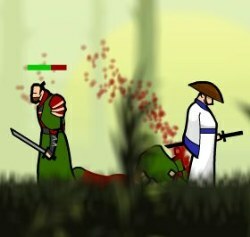 Hack and slash with your samurai sword to vanquish your enemies. The Straw Hat Samurai has returned with with new moves, air-combos, new enemies, new bosses, more slashing, and more blood. Use the MOUSE and LEFT MOUSE BUTTON to draw where you want to slash. Press the SPACE BAR to activate shunpo mode where you move so fast that the enemies stand still. Press P or ESC to pause. Your line needs to start below the enemy if you want to launch him for air-combos. In level 2, you need to draw a line from one platform to the next in order to jump from one platform to another. 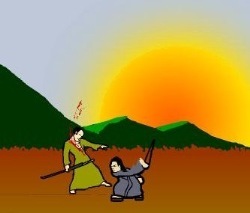 Your jump begins ONLY at the start of the line and ends at the endpoint of the line so start your line at the current position of the Samurai for best results. Activate shunpo mode when enemies are vulnerable to perform more damage. Especially for bosses. 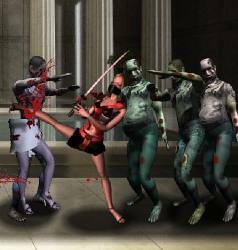 It is inefficient to attack armoured enemies by spamming slashes. Look out for their openings/weaknesses and use the special moves. Projectiles can be deflected by slashing them. When you are launched, activate shunpo mode to give yourself time to counter. Click here to send Straw Hat Samurai 2 to your friends using your default email program.